Color work - two little words that can strike fear into many knitters’ hearts. I confess. I used to be one of those knitters. I was always impressed with the amazing works that I would see fly off the needles of some of the knitters I knew. Every time I turned around, there was another hat. Or maybe a pair of mittens. And let’s not even mention the cute yoke sweaters they were making. I was in awe and my eyes (normally a pale shade of blue) would turn green. I had tried Intarsia in the past, and let’s just be kind and say that…ummm, I didn’t care for having multiple balls and twisting of the yarns. I thought Fair Isle would be the same. Until I learned a ‘secret’ – you only work with two colors at a time and carry one color in each hand. Which means…no twisting! I was super excited and couldn’t wait to get home and try it. I found a pair of size 8 needles and some scrap yarn in two contrasting colors and cast on right away. I didn’t even have a chart I wanted to use at first, I just wanted to try the technique. I am an English knitter (I hold the yarn in my right hand and throw the yarn around the needle), which meant I need a quick lesson in continental knitting (where you hold the yarn in your left hand and pick it). I had seen other knitters do it, so I had an idea of how it was done…but I still did a little surfing on YouTube to watch some videos and get some tips. It didn’t take long to get the idea and get started. After a few rows I had gotten the rhythm of using both hands down, but I noticed that the color that I was holding in my left hand was all bunchy and awkward. I was having a tension problem. While I was a little frustrated, I knew it was a problem I could fix. And then it hit me. It’s all about how I was holding my yarn! I had wrapped the yarn in my left just once around my hand, like I did when knitting English with my right hand. But since I knit looser with my left hand, I needed to have more tension on the yarn. It was as simple as wrapping the yarn around my hand a second time. I love it when I find a simple solution to a problem. 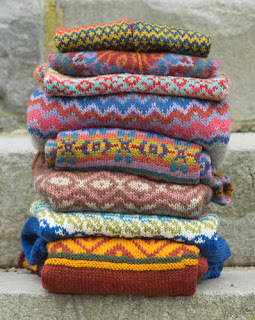 I am happy to report that I am not longer afraid of Fair Isle. And it’s a good thing too, with all the wonderful designs that are constantly being published. Next up in my queue of Fair Isle - this beautiful scarf from our Cathedral collection. 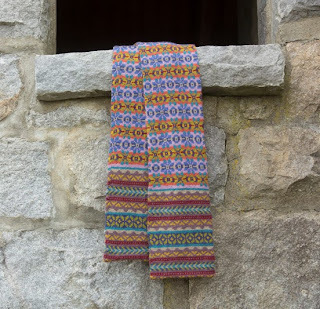 Bishop of Aberdeen is knit as a tube in the round; it uses 10 colors of Liberty Wool Light Solid and is a great way to try Fair Isle for the first time. The charts aren’t too complex, after a repeat or two; you will find that you need only glance at them.